Public libraries across the country are searching for ways to meet the evolving needs of its patrons. Libraries are seeing a trend towards increased demand for more collaborative work space, technology, and programming. The challenge is to find ways to evolve to meet the needs of its patrons within the available financial resources of the library. Messenger Public Library in North Aurora is out in front of this challenge. Kluber A + E is working with the library to renovate existing space to meet the needs of its patrons. 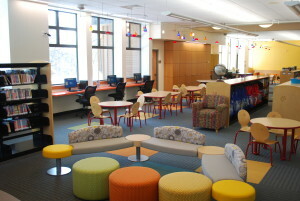 The library has just completed renovation of the Youth Services Department… and it’s spectacular! Kluber A + E led the project that created new space for high-demand programming, increased access to technology, new space and furniture that facilitates more parent/child and group activities, an expanded service desk, efficient “off-desk” work space, and an overall more open, colorful, welcoming space for its patrons. The project was completed without the need for physical expansion of the building and came in under budget. Congratulations to the staff, board of trustees, and L.J. Morse Construction Company for providing the leadership, skills, and foresight that serves the North Aurora community so well.